So this is my fifth video tutorial (others are on my youtube channel here) and I still feel like such a newbie. I took a photography course in school but never anything with video so editing it is somewhat of a slow process for me.. I am learning though! :) But I think that it is fun to do these sped up little easy tutorials for you guys because I like to learn by watching (sometimes three or four times..) and think that with these elementary tutorials it works. What do you think? Are these helpful and fun or would you rather I do a slow version with me giving you a step by step audio to go along with it? I love making them for you so I hope you love watching! I decided to try this hairstyle one day when I didn’t have a hair elastic (where do they always go?!) but had a ribbon in my purse for some reason. Once I tried it and it was cute I changed it a bit and also tried it with an extension for really cute wrapped look. I included how to do it with a ribbon in the first half of the video and an extension in the second half! I didn’t have any extensions in for the video but I did the same hairstyle with my extensions and posted the photo on my insta so if you want to see what it looks like check that out! 1. Tie back your hair into a side pony with a small clear elastic, leaving out any pieces that you want framing your face. 2. With your ribbon, tie it around the elastic and start wrapping it down your hair. 3. Once you get halfway done with your ribbon, start to wrap it upward. 4. When you get to the end, secure it with a bobby pin (try to do this a little more hidden than me.. oops!). 5. Tease the ends a little to get extra volume. 1. Clip in your extension to the underneath of your hair and toward the back. 2. Tie back your hair into a side pony with a small clear elastic, leaving out any pieces that you want framing your face and your extension. 3. Wrap your extension down your hair. 3. 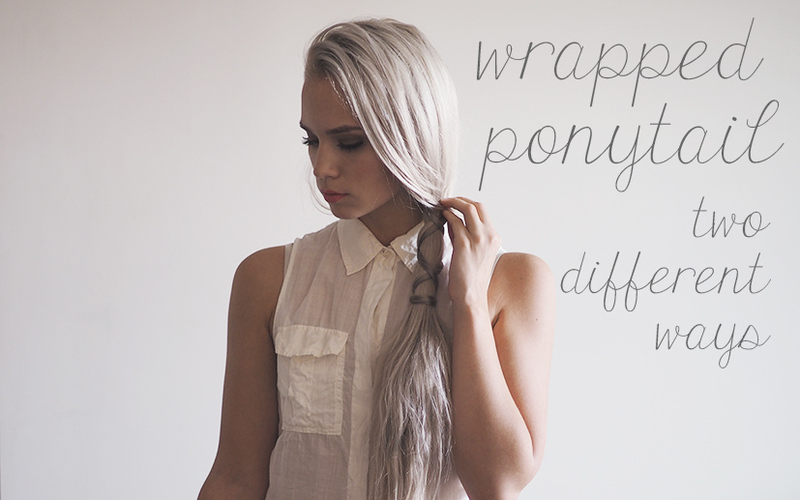 Once you get halfway done with your extension, start to wrap it upward. 4. When you get to the end, secure it with a bobby pin. 5. Tease the ends of your ponytail to get a little extra volume.